Synopsis: In Hebrew scripture men always get the exciting roles: leader, prophet, war hero. Convinced that women, too, need powerful stories that can inform them about who they are in relation to God, Nancy Werking Poling has imagined biblical men as women. A female Samson tells of the elders trying to take away her power; Nochat (Noah), who is trying to raise God-honoring children in violent times, rebukes God for destroying creation; Mosiah leads abused sisters to freedom; a female Jacob struggles with her capacity for deceit and destruction. Readers are sure to find inspiration in a creative approach to scripture that incorporates women's wisdom, suffering, and courage. 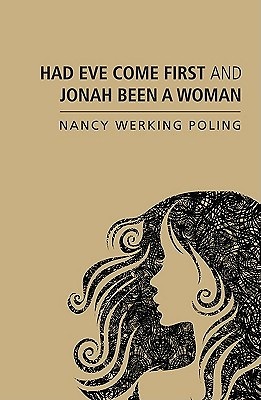 Endorsements: "In Had Eve Come First and Jonah Been a Woman, Nancy Werking Poling imaginatively retells biblical stories so that Eve is the first human being and God promises the blessing to Abrama, who convinces her husband to set off to new lands. Weaving through the stories are wonder at God's creativity; challenge of God's acts (destroying a sinful world and demanding the sacriﬁce of an only daughter); and lively and honest dialogue between God and Woman. As in her novel Out of the Pumpkin Shell, Poling uses vivid imagery and description of human emotions to tell tales that are gripping and full of life." -Ruth Duck Professor of Worship, Garrett-Evangelical Theological Seminary "Through an incisive and gripping retelling of the biblical stories Nancy Werking Poling allows contemporary women to find in them the voice and power that they have been denied by the original authors. These stories are vehicles for liberation, for they not only reinvent the old world but also imagine a new one. This book is a must for all those who are engaged in the construction of a more just and inclusive society." -Osvaldo D. Vena, ThD Professor of New Testament Interpretation, Garrett-Evangelical Theological Seminary "Nancy Werking Poling has created for readers a rare gift: a woman's perspective on the biblical story that is not only deeply imaginative but also surprises us at every turn With fresh and startling insight, her biblical women upend our old, "normative" assumptions about the nature of God Most High-and thus re-create the ancient impact of scripture as it was first heard. Beautifully written and full of 'Aha's' " -Gail Anderson Ricciuti Associate Professor of Homiletics, Colgate Rochester Crozer Divinity School "Nancy Poling uses her amazing gift of storytelling to help us imagine 'what might have been' if the Biblical stories had been told by and about women. The delightful surprise endings (as in the last line of Eve's story) and rethinking the narratives in light of feminist values are perceptive and thought provoking. Would Sarah have done what Abraham did? Poling thinks not The 'sacrifice' of Isaac is transmuted when the haunting story is told in terms of the domestic abuse of a daughter. Poling tells us she is not a biblical scholar, but her theological reflections are deep and perceptive. You will be both challenged and delighted with her stories. They will engage your soul, and you will never think of these narratives in the same way again." -Dwight W. Vogel Professor Emeritus, Garrett-Evangelical Theological Seminary, Evanston, Illinois Author Biography: Nancy Werking Poling is a Presbyterian laywoman who's been imagining biblical narratives ever since her parents took her to Sunday school and church as a child. She has worked as an educator, consultant, and writer/editor. Among her works are an edited volume, Victim to Survivor: Women Recovering from Clergy Sexual Abuse and a novel, Out of the Pumpkin Shell. She and her husband, James Poling, live in western North Carolina.